Summer. ‘Tis the season for casual al fresco dinners with family and friends. I needed a couple of desserts for this weekend and, because ours and other kids were going to be present, I figured I would make them a little something in addition to the “adult” desserts. Well, that’s one of the reasons I made these bars. Another reason is that the other desserts I had planned did not have any chocolate in them, and it is very hard for me to serve dessert without chocolate somewhere in sight. Another reason is that I have a 6 pound bag of pretzels in my basement – the product of a Costco impluse buy. We are pretzel lovers in this family, but I fear we may never actually get through this bag. Enter the Chocolate Chip-Pretzel Bar. This recipe comes from this month’s Food and Wine. It is rare that I get to a magazine recipe in the actual month it was written for. I am perpetually 6-8 months behind. But in reading through the August issue, this recipe jumped out at me as a perfect kid dessert. Yes, it helped me in the pretzel department, but it’s also easy and has chocolate sprinkles on top. What adult…er, I mean kid…doesn’t like sprinkles? 1. Preheat the oven to 350°F. Line a 9×13 inch baking pan with parchment paper, allowing overhang on the 2 long ends. 2. In a bowl, whisk the flour, baking soda, and salt. In a large bowl, using an electric mixer, beat the butter with both sugars at medium speed until light, 1 minute. Beat in the eggs and vanilla. At low speed, beat in the dry ingredients. Stir in the chips and pretzels. 3. Spread the batter in the pan and top with the sprinkles. Bake for 30 minutes, until golden; the center will still be a little gooey. Transfer the pan to a rack and let cool completely. 4. Run the tip of a knife around the side of the pan and lift the bar out using the parchment paper. Cut into 24 squares and serve. These look so good to me. I’m going to make them for this coming week! This looks so idea, however I’ll bookmark it since I fear any chocolate would instantly melt in the heat of our apartment. I love the addition of pretzels In fact, I’m sure the pretzels make it perfect. These are very adult to me….I love salt with sweet. definitely a crowd pleaser for all ages! “For the kids.” Good one. Dana this chocolate chip pretzel look insanely good!!!!! Both kid and adult will love this. 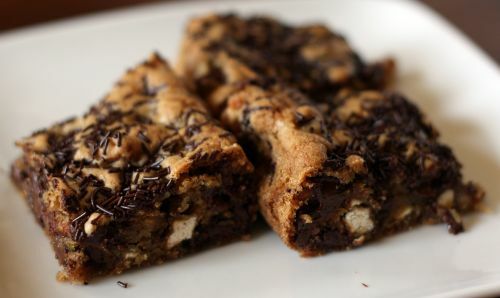 I love when pretzels are incorporated into desserts/cookies like this!! They look awesome. I’ll have to try them out sometime. I was just reading this last night before I drifted to sleep. Yum! Your gorgeous photos are making me want to try it right away! Am I child-like if I want to eat this? It looks AMAZING! Chocolate and pretzels is an ideal combination to my mind! There’s a pretzel crust for a chocolate tart somewhere in my files that I’ve been meaning to try. Could be a good use of some of your pretzels. Yep, these are delicious! Sent them to the office today. These look delicious! I can imagine how good the recipe must be given that you made it as soon as you got the book. I still have to make some things I’ve marked in the march issue of gourmet! 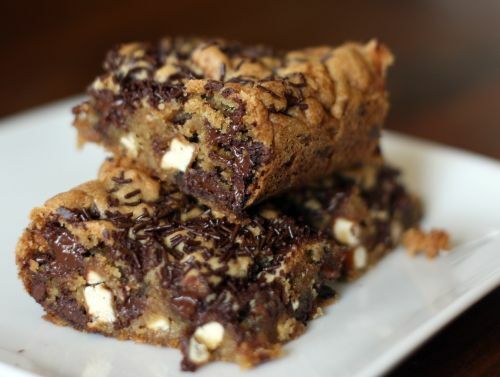 Just baked em up for an after dinner incentive…I might have nibbled on a corner piece…super good. Just to clarify, the measurement of granulated sugar is 1/2 CUP.